Much of the globe will have their eyes on Brazil in June and July, 2014. It's World Cup time. And as qualifying continues, 2013 Panini Road to 2014 FIFA World Cup soccer stickers capture what's happening in the sport leading up to the tournament. 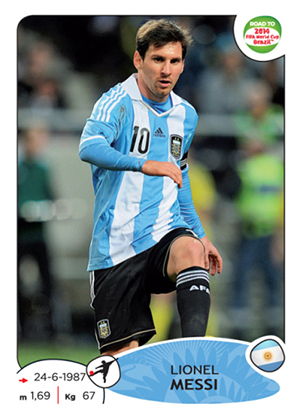 The 2013 Panini Road to 2014 FIFA World Cup collection includes 410 stickers. They come from the top 27 national teams heading into the year. Powerhouses like Argentina, England, France are all present, as is the home country of Brazil. Such international superstars as Wayne Rooney, Lionel Messi and Ronaldinho are among those on the checklist. 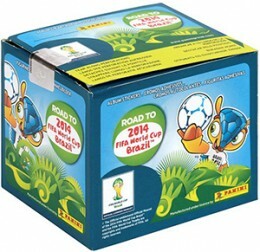 A 64-page album, done in full color, houses the 2013 Panini Road to 2014 FIFA World Cup sticker collection. As with most every sports sticker product, the collection is simple and straightforward. Packs are cheap, often available for a dollar or less. Stickers boast a large player image surrounded by a white border. The top has a small set logo. Bottoms have the player's name, a cropped flag and basic vital information.